Don Feigert, of Sharon, PA, is an award-winning writer of books, stories, magazine articles, humor, essays, and newspaper columns. 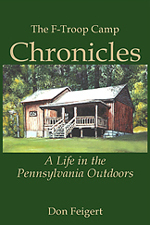 Feigert’s writing has been published in more than 75 outdoor, consumer, and literary magazines during the past 30 years. Feigert is the author of four books, Visiting the Pig Farm, The Evening Campfire, and Trucks are Better Than Women and the The F-Troop Camp Chronicles. A Hickory High School graduate with a Master of Arts degree from Edinboro University and former English instructor at Mercer High School and Thiel College and administrator at DeVry University and ITT Educational Services before retiring in 2015. His immediate family includes his son Fred, his cat Pooh Kitty, and his fiancée Donna Rai’, not necessarily in that order.